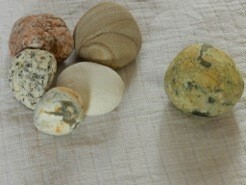 Choose a clean pebble or smooth stone that you want to felt. Select the sample of wool that you are going to use for felting and tease the fibres of the wool by gently loosening them and pulling apart. 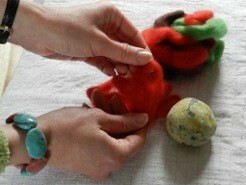 Wrap the teased wool apart around the pebble. Tease another length of wool of a second colour and wrap around the pebble in a different direction. Continue doing this with the other colours so that you now have a mixed pattern around the pebble. 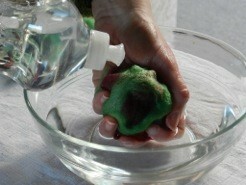 Immerse the wrapped pebble in a bowl of clean, warm water. Add a squeeze of liquid soap or washing-up liquid to the wet wool and gently roll the pebble around in your hands so that a lather is formed. 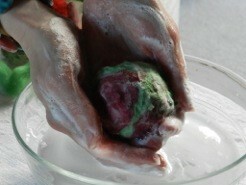 Add a second squeeze of soap if you think this is necessary. 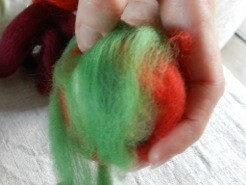 You are felting the wool by matting the fibres together in this way. 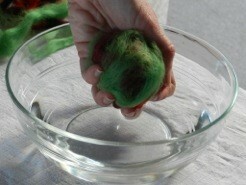 Continue the felting for about ten minutes, keeping the wool wet but not soggy. When the wool has felted around the pebble and it feels smooth, rinse the pebble thoroughly under a cold water tap to wash away the soap. 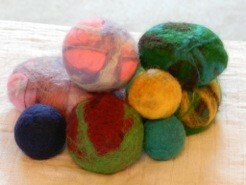 Allow the felted pebble to dry somewhere warm and leave overnight. More wool can be ordered by special arrangement from Hulton Crafts by contacting us by email or telephone.